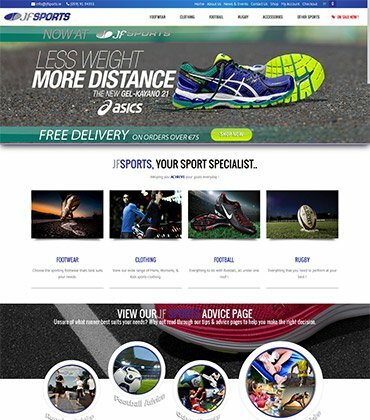 We were commissioned to deliver a new Website Design for JFSports. JFSports is an independent sports store established in 1999 by Jason & Stella Farrell. Their aim has been to provide the very best sports footwear, clothing and equipment to the sports people of Carlow and surrounding areas. They have set up this online sports store so that they can provide their award winning expert advice and great range of sports products to sports enthusiasts nationwide. JFSports specialise in Running and Football equipment, and offer a fantastic selection of products that cater to everyone from the absolute beginner to the dedicated elite athlete. They also offer a wide range of great products for Hockey, Boxing and Martial Arts. Our brief from the client was to deliver an Ecommerce Website Design which would professionally represent their existing and popular shop in Carlow Town and provide customers with online access to wide range of products in offer.